It’s been an exciting couple of weeks around here! 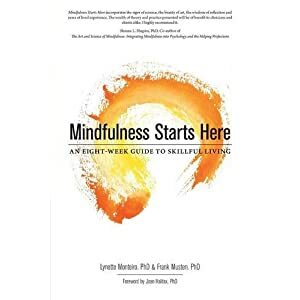 Not only has our book, Mindfulness Starts Here, hit the bookstands, it has been greeted with some very positive feedback from colleagues and friends! The process of putting this baby out on the road has also opened us to various other ways to share information and to take a mindful stance to social media and its entanglements. It was interesting to see how much pressure there is to set ourselves up for tweeting every 2 minutes, flooding the marketplace with posts on Facebook, LinkedIn, paper.li, and so on. The vision of the publicity team was quite different from our own and we found ourselves arguing about the merits of keeping a book full of books in our car trunk in case we were somewhere and someone asked to buy the book – or maybe we could flog it on the street-side. So the phrase “book-in-a-box” has become a mindful bell for us to remember that we can get too caught up in the process and forget that the intention of putting the book on the metaphoric road was to provide opportunities for practice. Along with keeping that intention in mind, we also noticed how easy it was to fall into an attitude or stance towards feedback or the statistics of the sales. Initially, it was fun getting to know what the Amazon ratings mean (nothing much as a global scale). Then we found ourselves comparing and contrasting with the ratings of other books. You know where that’s going, right? Oh that judgmental mind, ever ready to pounce and trounce! The best lesson in subtle grasping happened as we were trying to upload the meditations onto a format suitable with iTunes. We became so focused on the “iTunes” piece that the obvious solutions escaped us – even at 2AM when the millionth upload to a storage website failed again. There we were caught in ideas like “iTunes,” “podcasts,” and “stats for downloads!” Some of you who have subscribed to this blog may have noticed a couple of posts go by with links to the meditations only to find them dead links the next day. Sorry about that! It was just a skirmish lost with the internet gremlins! It took a while to shake off those ego-gremlins too and to let go of how the “big names” do it. Back to intention. Provide opportunities for practice. Current news & articles on mindfulness of interest – Flipboard of articles we think are outstanding. General grab-bag of news on mindfulness – paper.li format, check out various others like The DysthAnxious Daily. Of course, there are also the usual suspects of Twitter and Facebook. So please enjoy these offerings and remember that everything is an opportunity to practice. Even leaving all this for later, turning off your computer, tablet, phone, and seeking out the sunshine!